There are a few different types of pink mold, including fusarium and aureobasidium. Aureobasidium is a common bathroom mold, frequently found growing around damp window frames and on caulking. Fusarium is most often found growing on plants, including houseplants, but can also be found on wallpaper, carpet, and similar materials. It’s inadvisable to use carpet in bathrooms since it frequently gets damp and makes an ideal place for mold to grow, including molds like fusarium. Risks associated with mold in the bathroom include respiratory problems, inflammation and infections of the lungs, bleeding in the lungs, allergic reactions, hives and rashes, and a general feeling of malaise. Infants and small children, elderly people, and those with health problems are more likely to experience severe symptoms related to exposure to mold, but anyone can be affected. Even household pets can get sick when exposed to mold. 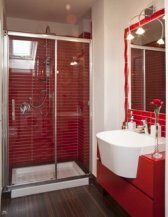 Bathrooms are naturally damp, making them an ideal place for mold to grow. You can help prevent the growth of mold in bathrooms by turning on the exhaust fan or opening a window when showering, making sure toilets, tubs, and sinks do not leak, and wiping up any water spills promptly. Don’t carpet bathroom floors; use throw rugs instead, which can be hung up to dry if they get wet. Inspect bathrooms regularly for any leaky pipes, leaky windows, or other problems and make any necessary repairs promptly. If you’ve found pink mold in your bathroom, your first thought was probably to get out the bathroom cleanser and start scrubbing. That’s a good start, but it’s often not enough to solve the problem. While it’s fairly easy to remove mold from non-porous surfaces like tubs and tile, it’s more difficult, and often impossible, to remove it from porous surfaces like drywall and carpet. Those materials usually need to be removed and replaced. In addition, if there is mold growing on bathroom walls, there is often mold growing inside the walls as well, in the insulation, on the inside of the drywall, and on the wooden studs in the walls. Any insulation contaminated by mold must be removed and replaced and wooden studs must be cleaned as thoroughly as possible and then treated with a mold sealant to prevent any remaining mold from continuing to grow and spread. When cleaning up mold and removing moldy materials from the home, a strict safety protocol must be followed in order to avoid spreading mold to other areas of the home and to avoid exposing yourself or your family members to mold spores that can cause serious health problems. The Environmental Protection Agency recommends against trying to clean up mold yourself if you have symptoms of mold-related illness or pre-existing conditions such as asthma that might be made worse by exposure to mold. If mold covers a large surface area (more than three feet by three feet) or if there is mold in your heating and ventilation ducts, the EPA also recommends calling in a professional. If you’ve got pink mold in your bathroom, you can schedule a free consultation with a mold remediation professional. An experienced professional will come to your home and assess the situation at no cost to you, then advise you about the work that needs to be done. Even if you want to do the work yourself, you’ll benefit from some free expert information and advice. An experienced professional can also offer tips for preventing mold from recurring in the future. To find qualified professionals offering free in-home consultations near you, just follow the link.